Johannesburg - South African swimmer Cameron van der Burgh says he's a "victim" of attacks in the Australian media as debate continues over his admission that he used an illegal dolphin kick in winning the Olympic 100m breaststroke gold medal in world-record time. 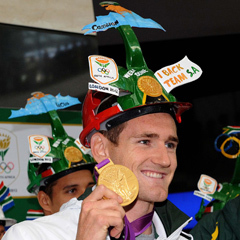 Arriving back in South Africa to a cheering crowd at OR Tambo International Airport on Thursday, Van der Burgh smiled and posed for photographs wearing the gold medal he won in London. Van der Burgh has acknowledged he did the extra kicks - only one is allowed in a 100m breaststroke race - but said he was forced to because the rule was not policed properly and illegal kicking had become common. After the race, Van der Burgh was quoted in the Sydney Morning Herald as saying that he had done extra dolphin kicks - other media reports said perhaps as many as three. An Australian, Christian Sprenger, finished second in the race in a time of 58.93 seconds, .47 of a second behind Van der Burgh's time of 58.46. "If you're not doing it, you're falling behind," Van der Burgh was quoted as saying in the Herald. "It's not obviously - shall we say - the moral thing to do, but I'm not willing to sacrifice my personal performance and four years of hard work for someone that is willing to do it and get away with it." On Thursday in Johannesburg, he denied any wrongdoing. "It's unfortunate, I've been the victim of some Australian press," he said. "Throughout my whole swimming career, I've never been disqualified once. I've never been warned once. From the heat to the semis to the finals, there were six different judges that watched every spot, every turn and every stroke and I was cleared. Those people are not there for holiday." As the fastest qualifier for the Olympic final, Van der Burgh swam in lane four, which was lined with numerous television and still cameras that appeared to document the infraction. But judges are not allowed to look at television or still-camera images. Since the race, officials from swim governing body FINA say they are considering the introduction of underwater video for judging.